The subject of yesterday’s City Council Neighborhood Committee meeting was the Central Parkway protected bike lane. City council voted 9-0 to approve this during the fall and several people I know recommended attending the meeting as for some unknown reason the issue was being raised again. I went down to show my support for the bike lane wondering if this was going to turn into another streetcar debacle. It didn’t. At least not yet. But it was very interesting. The first question I had was, why revisit something which had input from over 500 residents and business owners during the planning process, was passed unanimously by city council in the fall, was approved by the community councils of Clifton, OTR, and Northside, and has funding in place? The answer seemed to be that one business owner in particular was raising a stink. Tim Haines is the owner of 2145 Central Parkway. He is upset about the loss of free parking in front of his building between the hours of 7-9 am. In the interests of defending his interest, Mr. Haines has been organizing other business owners against the proposed bike path. Fair enough. He has the right to be concerned about changes. I don’t necessarily agree with his case as the plan looks well thought through and the impact to businesses seems minimal but he does have every right to make his case, albeit a bit late. I sat next to another business owner on Central Parkway and struck up a conversation with this person before the meeting. He seemed concerned as well about the potential loss of parking but also much more supportive of a bike path. In fact, many of the business people seemed supportive of a bike path. And, as a bike rider, I have to say I was worried that somehow this plan was unfair to businesses and might hinder commuters. Until, that is, I saw the plan. I’ve ridden Central Parkway for years as a car driver, bicyclist, and on my scooter. I’d heard that the bike plan would reduce Central Parkway to a single lane each way and this worried me during rush hour commute. 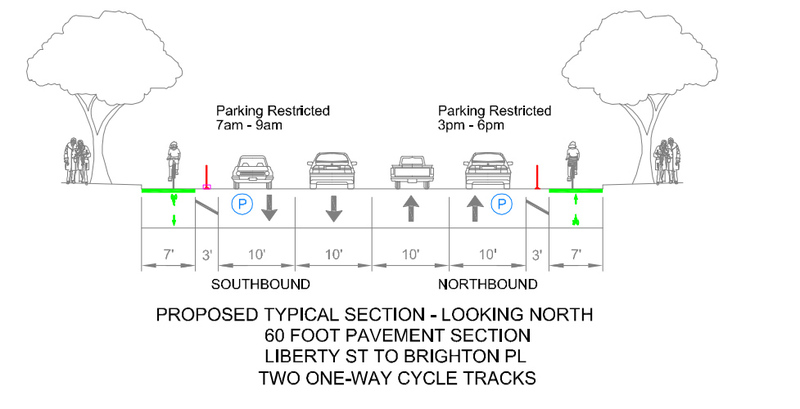 The actual plan, however, accommodated rush hour traffic by increasing the number of lanes. During rush hour, parking lanes would be opened up to accommodate traffic. On-street parking would be available at all times except from 7-9 am and from 3-6 pm. At Mr. Haines location, he would only be affected by the 7-9 am hours. In other words, people could park as they had always done for 22 out of 24 hours. This is the same situation downtown Clifton and other neighborhoods face in terms of parking. Ludlow Avenue, for example, is opened up to 2 lanes in the business district headed towards the University of Cincinnati every morning from 7-9 am and in the reverse direction every afternoon from 4-6 pm. I have trouble using public money compromising a plan there’s nothing wrong with for private business. I will go you a step further Councilman Young, isn’t what we’re doing really building a $110,000 2-hour a day parking lot for one disgruntled property owner? It didn’t hit me what was really wrong with this picture until I was reading the Enquirer write-up this morning. Reading the Enquirer write-up helped me understand the politics behind this debate. The Enquirer framed this as a debate between the “bike people” (read liberals) and the “business people” (read conservatives). I believe you’re familiar with this debate. In the standard version of this, the bike people are some kind of radical hippies standing in the way of business, and the business people are heroes just trying to make a buck always being thwarted by mean-spirited socialists suppressing their entrepreneurial zeal. Only it won’t slow traffic according to traffic engineers. And parking is exactly the same except during rush hour from 7-9 am and 3-6 pm going the opposite way. Why doesn’t the Enquirer mention these facts? Once the business person I spoke with understood the plan, he wasn’t upset. He was upset only by misinformation. Misinformation of the Enquirer kind. This seemed to be a common theme with everyone. Council must put the needs of business first and last. This is the radical belief I’m talking about: government exists solely to meet the needs of business. Now it might not seem radical to you because certain business groups have been working to socialize this idea for at least the past 40 years. To me, however, it’s a radical belief in a country founded “by the people, for the people”. Yet this is the belief that our current Mayor seems to be fighting for (and the Enquirer seems to be helping him out by framing the issue as businesses against people). Things got tricky earlier this month when Mayor John Cranley started hearing questions from the business community about the bike path and what it would mean to them. That’s when tribes started forming. Mayor John Cranley and divisiveness. Surprise, surprise. Do these divide and conquer tactics sound familiar? 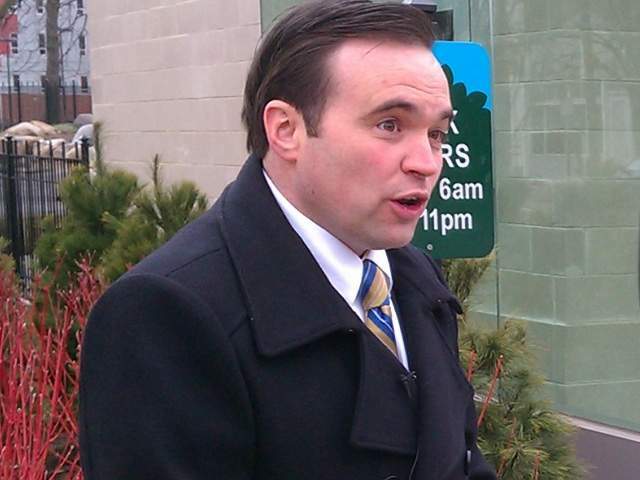 Remember when Mr. Cranley pitted downtown against neighborhoods to win the Mayoral election? What’s the game now, Mayor Cranley? Crancel the bike path? Or is it politics? Or did you just want to establish a precedent of City Council appearing to be on the side of business? Whatever it is, I don’t buy your story or the Enquirer’s story. I was there. It wasn’t businesses versus bikers. The business owners I spoke with wanted a bike path too with the apparent exception of one guy at 2145 Central Parkway and the people he rallied. The bikers I spoke with and heard from were very supportive and respectful of the business owners as well. And when the plan was actually explained, everyone seemed ok with it. In other words, it sure didn’t seem like a liberal/conservative story though that’s what it looks like someone is trying to push. It looked more like a story about building a $110,000 parking lot for a single property owner for 2-hours/day and a Mayor who seems to want to push this radical idea that government should exist solely for the purpose of business. The bike path is paid for by a federal grant from the government. The parking lot for Mr. Haines is not and will cost the city $110,000. I appreciate your comments and share your concern about our democracy. But in this case, I do not see that. The individuals concerned were not donors or special interests, but simply residents of our city who have invested and are providing jobs to ordinary citizens and do not appear to have had any input on a plan that would impact them greatly. When I first raised the idea of having a public hearing, it was welcomed by supporters and opponents of the plan. While I respect the Vice Mayor’s opinion, I do not believe that our city should be in the business of building parking lots for business owners. For two hours a day. If this is the case, where does it end? Won’t other business owners be angry and demand similar handouts?